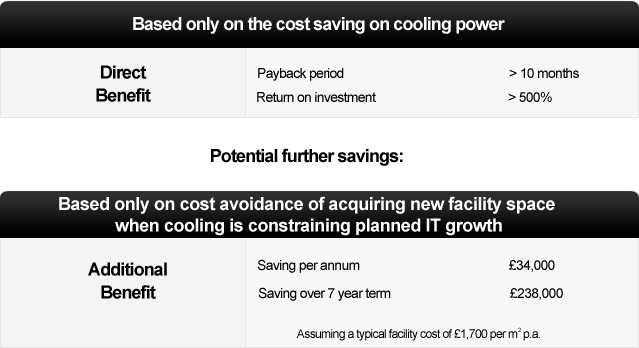 Savings of between 10 and 30% of the current operational cost of building cooling systems supporting data centres. Full return on investment in ~9 months is highly achievable just from power savings. acquisition of new space can have a major cost benefit. Power savings on room hardware (servers, switches, routers, etc) and extended equipment life spans. Financial benefit from reduced carbon emissions associated with running the data centre. Investment in the solution is depreciated over 7 years.